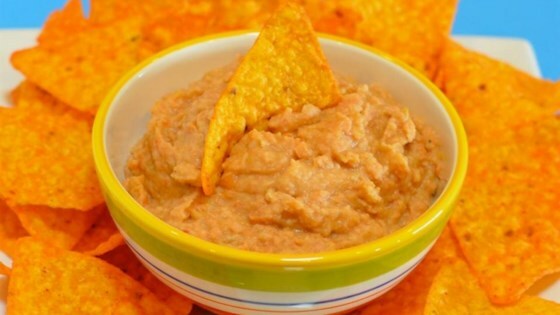 "Just like the bean dip you buy in the store but a lot less expensive. The heat can be easily controlled." Place pinto beans, vinegar, jalapeno pepper, salt, sugar, paprika, onion powder, garlic powder, and cayenne pepper in a food processor; blend until smooth. This dip is wonderful! My hubby loved it! I did add 2 roasted green chilies, 1/8 tsp. of garlic salt and a pinch of cumin. No more buying the little can of bean dip! Great flavor but way too salty. Next time I won't add the salt. After tasting, I increased the amounts of all of the spices quite a bit, and threw in some cumin.